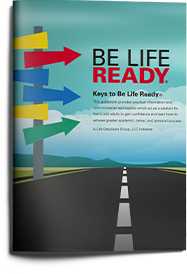 The knowledge gained from each of the 9 Keys to Be Life Ready® will provide individuals with valuable information to help them be better prepared to create a more satisfying and productive life. #1 Be educated and a lifelong learner. Education is power. To achieve a lifetime of success a strong foundation in reading, writing and math is essential. By having this foundation you’ll be better prepared and more likely to graduate high school and to continue your education at a two or four-year college or to gain access to job training opportunities. Commit to staying in school, becoming educated, and to making good academic and career decisions by developing a realistic educational plan that results in achieving your academic and career goals. #2 Create and Maintain a Success Team. In sports individual players don’t win games, teams do and they rely on teamwork and the support from others to achieve success. People striving for success need to build and effectively manage their own Success Team. #3 Develop a Success Plan. People who achieve success develop a Success Plan to guide them as they make important decisions critical to their futures. Use the Success Planner to begin to collect information that will help you set your academic, career, and personal goals. #4 Use an effective decision-making process. Regardless of what point you are in life, you probably have been asked to make important decisions. How did you make those decisions? Did you choose the first thing that came to mind? Did you let others make those decisions for you? Did you avoid making the decision as long as possible? If you are like most people you have never been taught how to make decisions properly even though decision-making impacts all areas of your life. Decision making isn’t something that comes naturally. It is a skill that needs to be learned. Becoming successful requires the ability to make good decisions, ones that lead to favorable outcomes. #5 Make good big-ticket decisions. The role that decision-making plays might be easier to understand if you look at the areas of your life that have the greatest impact on its quality. Throughout your life, you will make decisions in “big-ticket” areas, and the choices that you make along the way will define your life and the direction it will take. #6 Focus on personal development. Personal development is a significant component of the overall career development process that will evolve through teen and adult years. #7 Be knowledgeable of skills. Most people have difficulty identifying their skills and applying those skills to a particular activity or occupation. Think of a skill as simply an ability to do something, whether it is a natural ability or one learned. #8 Market yourself and interview positively. Throughout your life there will be times when you will be interviewed to determine your qualifications. You should understand the purpose for it and what you and the interviewer are seeking. The interview might be to gain acceptance into a school or college, to receive a scholarship, or to be hired for a paid or volunteer job. The ideal interview is one in which a conversation takes place and there is a mutual exchange of information. Prepare by visualizing yourself in that situation and tailor your presentation to market yourself accordingly. #9 Understand how to find a job. In order to locate a meaningful job in a rewarding career path that will take full advantage of your abilities and interests, you’ll need to start by determining your most important needs and wants. Then, in keeping with the decision-making process, you’ll want to identify, research, and select employment opportunities that are most appropriate for you. Keep in mind that ultimately, your success in the job search will depend on how well you can demonstrate the value of your abilities and interests to prospective employers.